Please note that the BALANCE class is a prerequisite for other class types. For the most updated daily schedule, please go to our Booking page. We call it our beginner class, but we still see the helpless, sweating faces with eyes pleading for a break. BALANCE class focuses on flexibility, core strengthening, and body control, and is the prerequisite to the other class types. This is a great introductory program to get used to the motion of the board and to develop the mind-body connections necessary for our other programs. It’s the best way to quickly master your body on the board. When you need to get tough with your core, this is the class for you. CORE class focuses primarily on building core strength and developing lean muscle in the entire body. With lots of compound body weight exercises and resistance training in a moderate tempo, Core sculpts your arms and legs, and builds you the body you’ve always wanted. 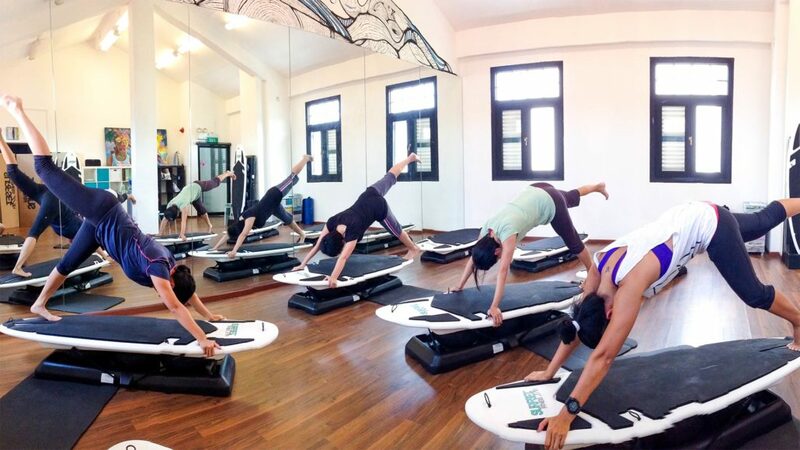 There is an exquisite feeling in ramping up the intensity of the workouts on our boards. 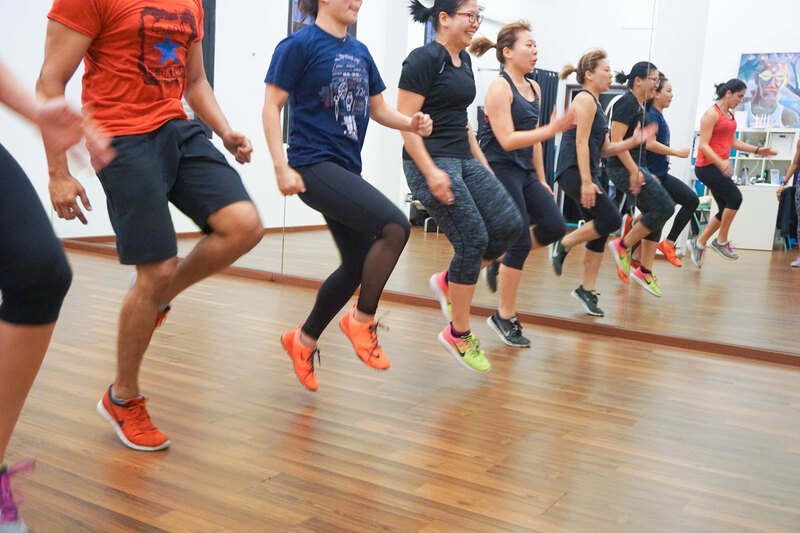 SWEAT class focuses on building aerobic capacity, burning fat and pushing past plateaus with quick, high-intensity sprints. Get ready for a total-body toning session as all moves require you to recruit muscles throughout the whole body. This is the class for the dauntless types who demand the best from their bodies. Classes need a minimum of 2 registered participants to run. Classes without the required number of participants will be cancelled 12 hours before class start time and any participant affected will be informed by SMS or phone. However, you can call us as late as 30 minutes before a scheduled class time to find out is there’s a board available for you to join the class. All classes start on time. Please arrive at least 5 minutes early to get changed and prepare for your session. SURFSET Fitness reserves the right to reject participants who are more than 10 minutes late. Participants who are late will still be charged for the full session. As a courtesy to your instructor and other clients who want to join our classes, please inform us at least 24 hours in advance if you need to cancel a booking. Late cancellations (less than 12 hours notice) will be charged at the full session price. Please turn off or silence-mode your cell phones in the studio, as your ringing phone may cause others to lose concentration and fall off their boards! Please bring your own towel for your workout. Besides our signature SURFSET classes, we also offer off-board sessions – these are classes held on our studio, off our boards! During these sessions, the SURFSET boards will be stowed away, and you’ll be back on safe, solid ground. Acroyoga is a form of yoga which combines yoga with acrobatics, essentially the stacking element – where a group of people climb atop each other. Combine that with yoga, and you get a group of people climbing atop each other in yoga poses. Acrovinyasa is a variant of acroyoga which incorporates Vinyasa flows into its structure, and is now one of the fastest growing standardised form of Acroyoga in the world. Read more about our Acrovinyasa classes here. Our Acrovinyasa classes run on the second Saturday of each month. Our Get Fit! classes aim to help you raise your endurance, increase your strength and improve your mobility. Led by Nike Training Club trainers, we want to ensure that you are not merely exercising – but training! Let us guide and motivate you to push your limits further in your journey to fitness, and train with a purpose and a goal. Look forward to a great workout experience scaled to your ability. This class is suitable for all fitness levels from beginner to advanced.